In this brief interview, Song Zhi Yong, a disciple of Xing Yi Master Li Gui Chang, remembers his teacher and talks about Master Li’s character, ability and views on martial etiquette. Song Zhi Yong currently teaches Xing Yi Quan in Taiyuan, China. Song is a Senior Advisor to New York Internal Arts and Internal Arts International. 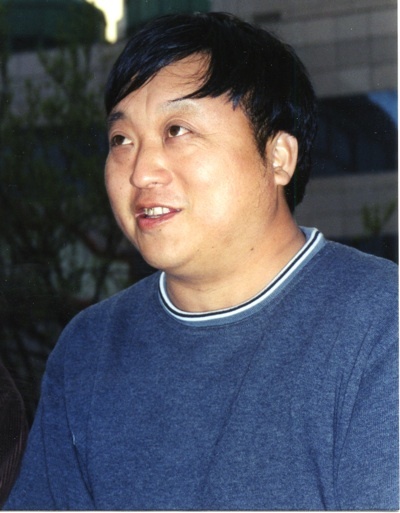 Song Zhi Yong, Taiyuan, China, 2001. photo by Valerie Ghent. Song Zhi Yong, strong in physique and in the prime of life, was accepted as a disciple of a School Grandfather, Li Gui Chang, in Master Li’s old age. We met in Fenghe Park. In the park, among the shadowy green trees, fine grass, rippling water pools, and silent surroundings, the two of us pleasantly sat on a stone chair. At that moment, a middle-aged man was training Zhan Zhuang, the standing posture, nearby. After asking Song, I knew the man was Song’s disciple. Just as the disciples of the school said, Song Zhi Yong is very hard working. “I met my teacher, Li Gui Chang, via Zhang Fusheng in 1990. In talking about my teacher’s art, Master Li was the most incomparable master I have ever seen or heard of. 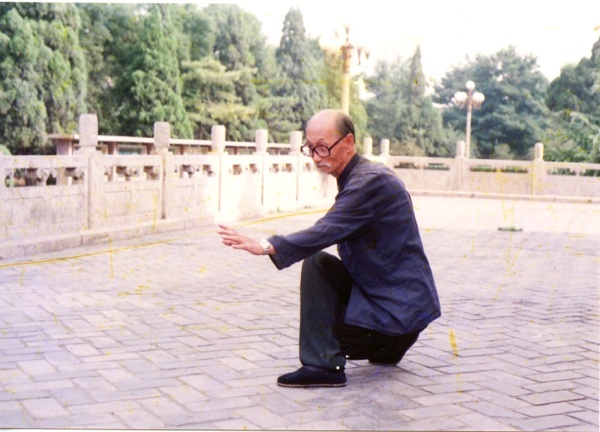 For example, in an activity organized by Taiji Association in 1993, my master taught Cai (採, picking up) Lie (列, splitting), Zhou (肘, elbow) and Kao (靠, leaning against), demonstrating on me. At the time, I weighed about 100 kilos and was not flexible nor agile. But my teacher was able to make me roll 360 degrees in his arms, I fell to the cement ground with a loud sound. At that moment, my heart and mind were empty and I thought I was finished. To my surprise, I was not injured and I jumped up from the ground instantly, as comfortably as if massaged. At that moment people were stupefied and struck dumb by Li’s power. “Let’s talk about my teacher’s Pi Quan (Splitting Fist), in throwing a person down. In throwing a person down (ie: emitting force), some other masters would block an opponent’s leg with their foot, or would use a bed or another object to entangle, trip and throw down the opponent. My teacher could hit a person up into the air, landing about 5 or 6 meters away. In doing Yun Shou (Cloud Hand), he was able to throw a person upward. It was truly divine and marvelous. “Moreover, the sensitivity of my teacher’s reaction in his body work and hand techniques was unimaginable. On one occasion, at a training course organized by an electronics company, my teacher rode his bicycle quite fast. When he made a turn into the factory gate, the rear of his bicycle was hit by a small car. Exactly at that moment, my teacher jumped off his bicycle and stood at the side of the street. At that time he was almost 80 years old. “We just talked about my teacher’s art. Now, let’s talk about his morality. Master Li Gui Chang practicing Long Zing, or Dragon. My teacher said some people would feel inferior in dealing with officials, but we had to be a class above when dealing with them, because when someone wants to learn the boxing art, no matter how high they are in rank and position, they are just a student or disciple, and we are the teachers or masters. If you are the governor of a province, then we are the teachers or masters of the governor. Training must be conducted according to the rules of the martial arts, otherwise it is not possible to extract the real art from the training. “From this story, my teacher might seem very arrogant. But actually it is a matter of having respect for the teacher. Once you were lucky enough to be a disciple of my teacher, he would take painstaking care and effort with you. One winter, not long after I was accepted as his disciple, during one of the coldest days of winter, I woke up in the morning to see it was snowing outside. I just wanted to be lazy. Just when I got back under the warm blanket to go back to sleep, I heard a knock on the door, and teacher’s voice: “I was conveniently passing by, on my way a sports committee meeting and decided to look in on you.” I knew no meeting would be held at six in the morning during the dark cold of winter. He just came to see whether I was up and training. An old man at almost 80, riding his bicycle on a snowy day, from Qingnan Lu all the way to the Finance and Economy College, to check up on his disciple’s training. I was really very moved by his devoted spirit. “Throughout his life, my teacher compared his art with numerous people and triumphed over them. But he was against the powerful bullying the weak. At that time, I was young and powerful. I met with a senior master in Beijing, who was very talkative, saying how powerful he was, and how he had disciples over China. He demanded that we push hands. The result was that I threw him down and I was very pleased. When I returned, I told my teacher, hoping he would be happy about my deeds. Instead, my teacher sighed: “Song, do not be happy, everyone will get old.” My teacher’s kindness made me regret this incident throughout my life. “My teacher’s selfless contribution to the development of Nei Jia Quan can also be seen in his publication of a Tai Ji Quan manuscript. This manuscript on Tai Ji Quan, cherished and collected by my teacher, is not an ordinary boxing manuscript that talks about the theory or shows the empty forms. It is in fact a detailed record on how to train the gong fu, and how to practically use Jing-Li (strength) and shou fa (hand methods). I can say that it is a rare and invaluable martial arts manual. “The time flies like an arrow and ten years have passed. Now, any time when I feel puzzled in my training, I recall my teacher, his smile and voice, just like yesterday. I remember ten years ago on October 16th, I accompanied my teacher to teach in Shanghai, and he demonstrated to all of us in the afternoon and evening and gave a lecture on the martial arts. In demonstrating Heng Quan, he was able to lift up a person of over 100 kilos with single arm. Who knew it was his last chance in his life to teach the students. Back in Taiyuan on the 17th, he told my school brother Li Runxi (Li’s son): “I must leave”. At midnight that night, he had no blood pressure. On the day of the 18th, he finished his ordinary and yet remarkable life.